Hall Landing Large waterfront lots starting around $59,990. Hall Landing is a very special offering. It consists of only nine lots- all waterfront-each 10 acres big! 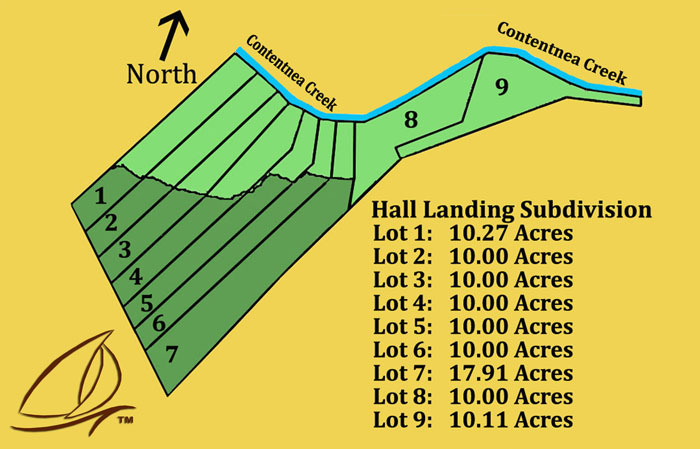 Hall Landing is sited on Contentnea Creek in Greene County, NC between Kinston and Greenville. This waterway of the Inner banks is famous for hunting, fishing, flora and fauna and archeological finds. Native American artifacts have been discovered along Contentnea Creek dating back to 8,000 BC. Ownership at Hall Landing allows for an associate membership to Cutter Creek Golf Club, a semi-private club located close by. This is a Professional Golfers Association (PGA) certified 18-hole championship course. Fishing opportunities from Hall Landing include hickory shad, striped bass, sunfish, largemouth bass, perch, catfish, pickerel and more. Wildlife and game in the area include deer, quail, pheasant, bear and duck. Other amenities include proximity to public boat ramp, good soils and elevations with private well and septic systems for each home site. Hall landing is an incredible opportunity! Hall Landing 10 acre waterfront lot prices start from $59,990. For maps, directions, prices and more information contact us today. FAQ’s: Greene County is the epicenter for the North Carolina Global Transpark, a 2,400-acre industrial complex and jet-port. Greene County is less than 2 hours from the North Carolina beaches and approximately 1 1/2 hours from Oriental, the sailing capital of North Carolina. East Carolina University is less than a half hour away. Directions: From Hwy. 70 in Kinston take Hwy.58N. Turn right on Dixon Farm Road, then left on Old Hall Landing road. Hall landing is approximately 2 miles from downtown Hookerton, NC.